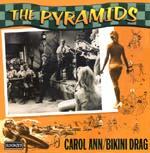 The Pyramids were among a small number of surf bands that got significant airplay and sales outside Southern California during surf's hey day. their hit "Penetration" is widely known and often covered. This single pairs the rare "Bikini Drag" from a soundtrack with the previously unissued vocal "Carol Ann."